Happening right now: march and protest at the family detention center in Dilley, Texas. Activists from around the country have converged on Dilley to call for an end to family detention. This is just one of the significant issues that are playing out everyday as a core element of U.S. immigration policy--and which will not be touched by Obama's executive action. In fact, the executive action calls for stepped up enforcement at the border and will deliver more immigrant families to detention centers like the one in Dilley. Grassroots Leadership, based in Austin and a leader of the Dilley protest along with Texans United for Families, describes the current problem: "...in 2014, the Obama administration announced it would renew the mass detention of immigrant families. A family detention center was opened in July at a law enforcement training center in Artesia, New Mexico. The administration then announced that it would start detaining families at a GEO Group-operated facility in Karnes County, Texas and it would expand the Berks County detention center. In its supplemental appropriations request to Congress, the administration asked for up to 6,300 family detention beds across the country. " Read the entire information piece on family detention on the Grassroots Leadership website. The third annual National Strategy Session to End Criminalization, Incarceration and Immigration Enforcement begins tomorrow, Sunday, May 3 in Boca Raton, Florida. 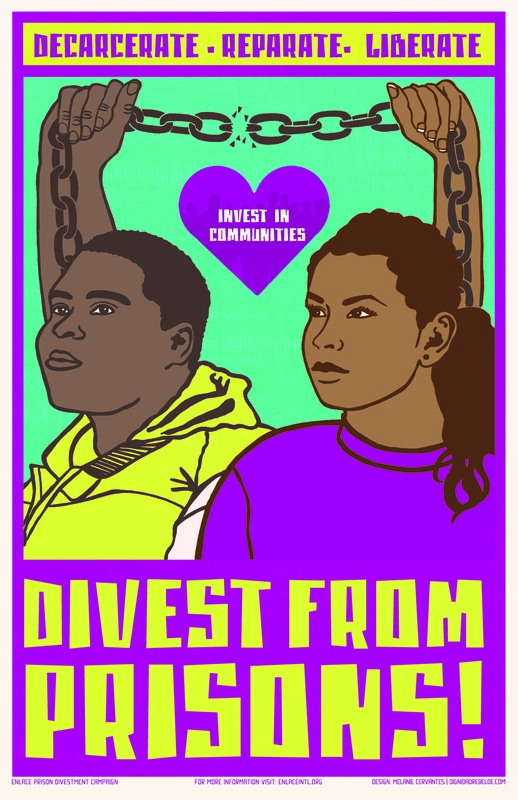 Organized by Enlace Int'l and the National Private Prison Divestment Campaign, the gathering creates a strategic space to examine the intersections of mass incarceration and immigration, and to build greater collective action. On Wednesday, April 29, various groups protested in Boca Raton at a GEO shareholders' meeting. Check out this video and article on the protest in the Palm Beach Post. A partnership of groups has launched a Mother's Day petition calling for an end to the detention of immigrant mothers and children. Check out the call to action, information about a Mother's Day "thunderclap" and sign the petition here.